DEVELOPERS are upbeat the local property industry will do better in the second half of this year due to positive market sentiments, but cautioned of setbacks in the early part of 2013. "There is a bit of cautiousness out there because of negative news like a possible property bubble and concern over the general election. All these will affect the market in the first half of 2013, but minimally. "If there is any bubble, it will only happen in one or two hotspots in Kuala Lumpur," said Real Estate and Housing Developers' Association of Malaysia (Rehda) president Datuk Seri Michael K.C. Yam. Yam said another myth faced by the property industry is complaints of houses being overpriced because of higher foreign ownership and speculation. But Yam said only less than two per cent of residential properties here are owned by foreigners, majority of which are located in the Kuala Lumpur city centre. Yam said properties have become more expensive because of the hike in price of building materials and increasing labour and land cost. He said Rehda is, in fact, encouraging foreign ownership of high-end properties in Malaysia to add to the vibrancy here. "We should not worry as foreign buyers are not tampering the bread and butter properties here. There are ceiling prices where they can only buy properties of a certain range," Yam added. 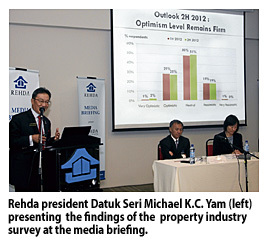 Meanwhile, according to a recent property industry survey by Rehda, about 56 per cent of the 180 companies which has responded said they will launch new projects in the second half of this year compared with 46 per cent in the first six months of 2012. More than half of the respondents said they expect their sales performance to be above 40 per cent for the next six months, from bigger scale projects. The survey shows that majority of the developers will price their properties between RM250,000 and RM500,000, comprising a mix of single- and double-storey terrace houses and service apartments. The market will be driven by domestic buyers, mainly for their own use. "The loan tightening rule by Bank Negara Malaysia has left out an increasing number of potential buyers facing difficulties in obtaining loans. We hope the government will relax some rules," Yam said.